Search Results for "bong smoking"
Slow motion two males enjoying Vietnamese Thuoc Lao pipe bong, Smoking & smiling. Male lighting & smoking bamboo bong pipe & exhaling smoke. Vietnam. Cannabis turns to orange glowing embers as it's pulled through the stem of a bong and smoke is exhaled. Extreme close up. Medical marijuana is lit and inhaled from a bong and cannabis smoke slowly falls. 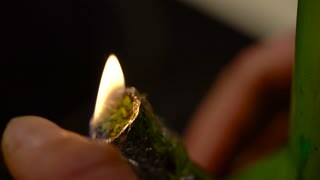 A bowl of marijuana turns to orange embers as it is lit with a torch lighter and smoke fills the bong. Smoking weed / smoking marijuana out of a bong. Bubbles and smoke in a dirty bong filled with blue flavored water. Close up. Smoke pours over a bong after a large hit of cannabis is taken on a wood office desk. 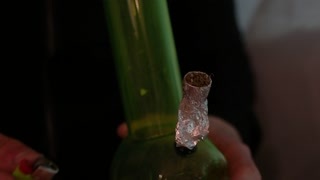 Closeup of a person smoking marijuana/cannabis in a bong.